There’s always some skepticism when a vaporizer boasts the ability to be used for both flower and concentrates. Can the same vape really produce equally superior hits whether you’re smoking dry herb or a concentrate? In the case of the Air Vape X, damn right it can! The AirVape X stands as the new and improved upgrade to AirVape XS, which was already regarded as a premium dry herb and loose leaf vaporizer. Now, with the AirVape X, you can vape a dab of wax and a bowl of flower in the same session with ease. 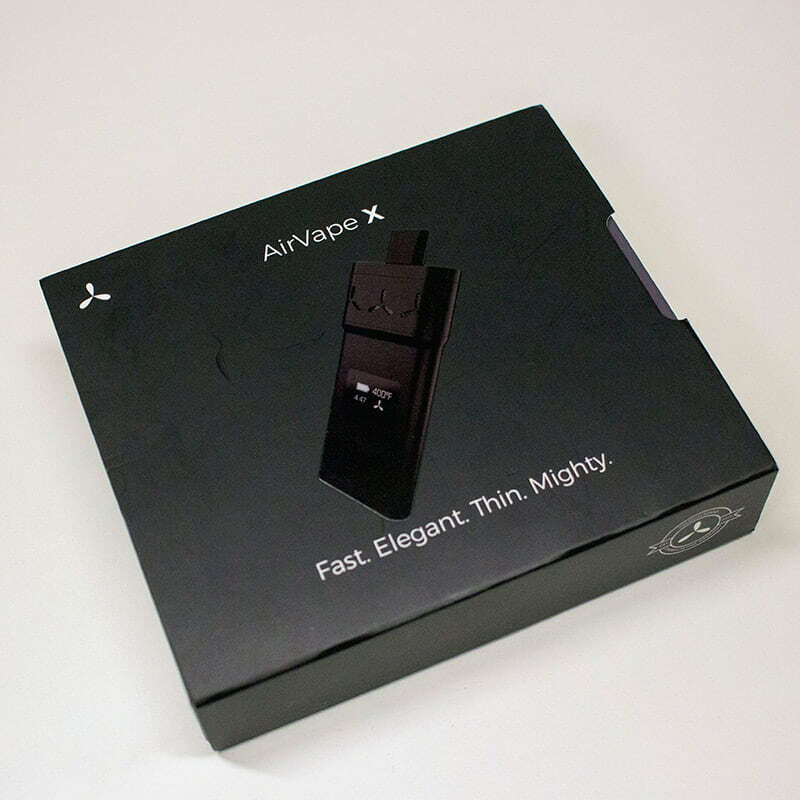 The sleek all-black packaging of the AirVape X has a modern and minimal design that you would imagine some hip new computer accessory coming in. The AirVape mirrors that same lustrous aesthetic, with its durable and smooth steel body and ceramic mouthpiece. 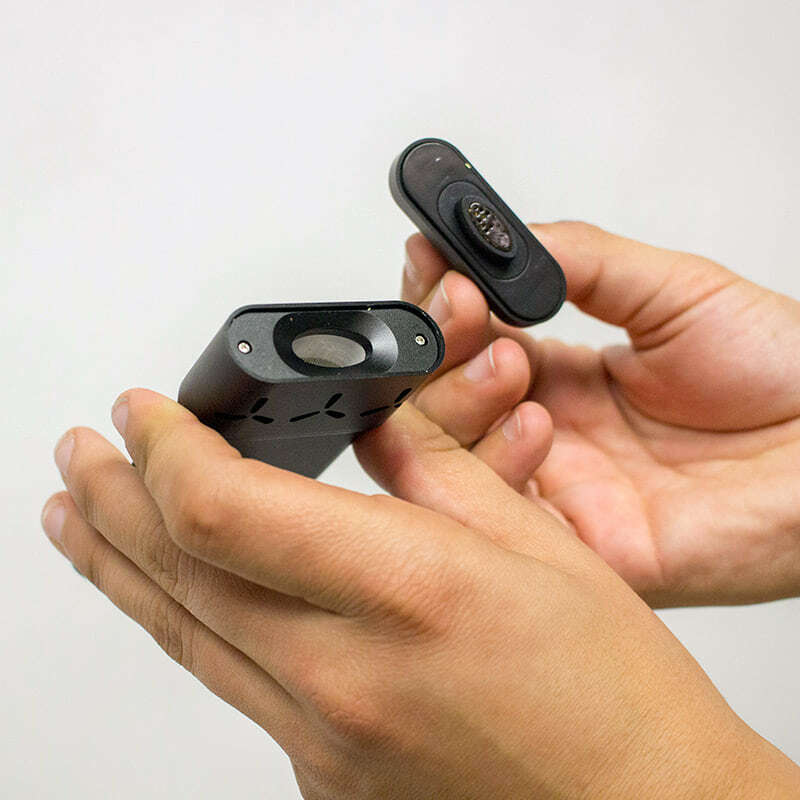 The oval ceramic mouthpiece is part of a short list of newly upgraded features, including a ceramic airflow box and a strong magnetic structure that makes the mouthpiece super easy to connect and disconnect. The AirVape X dry herb and wax vaporizer features hybrid conduction and convection heating that thoroughly vaporizes dry herb for smooth, potent, and tasty hits. The ceramic chamber heats the bowl (conduction) while hot air flows in to cover every millimeter of surface area (convection). The vapor travels down an isolated air path, retaining essential flavor and potency from your cannabis. 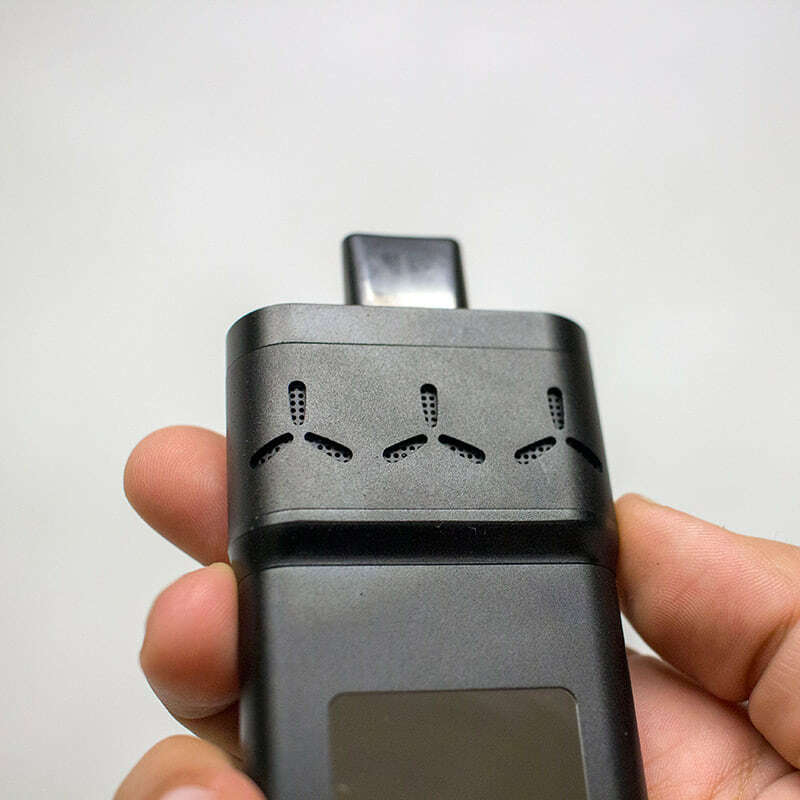 After using the AirVape X for both concentrates and dry herb, we can honestly say it provides outstanding performance for both types of cannabis. 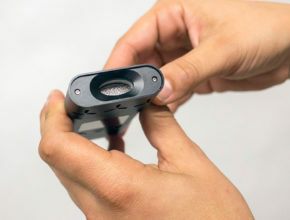 The perfectly sized, oval-shaped ceramic chamber, plus the compartment underneath the chamber that accumulates hot air, both allow for extra smooth vapor and even heating. 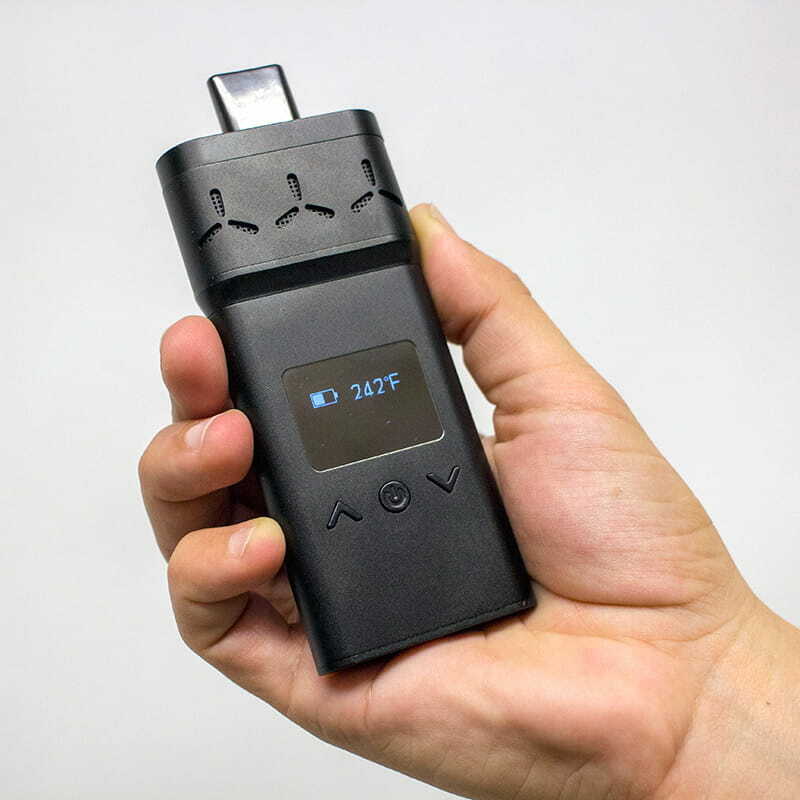 The AirVape X vape vibrates when it is ready, and an elegant, almost 1.5” LCD display shows the battery level, exact temperature settings (200F to 420F), and the automatic shutoff timer. The vibrating function discretely warns you when it’s reached the desired temperature. The temperature is managed by the two-button temperature control to the exact degree. Step 1: Load the ceramic chamber with your ground up dry herb. 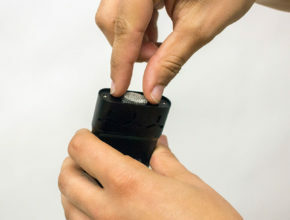 Step 2: Turn on AirVape X by pressing the power button three times quickly. Step 3: Set the temperature to the exact degree of your choice with the up and down arrow functionality, and let the unit heat up. 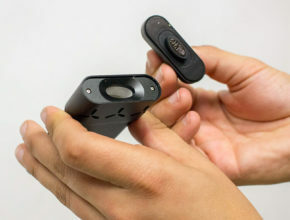 Step 4: When device vibrates, inhale vapor. 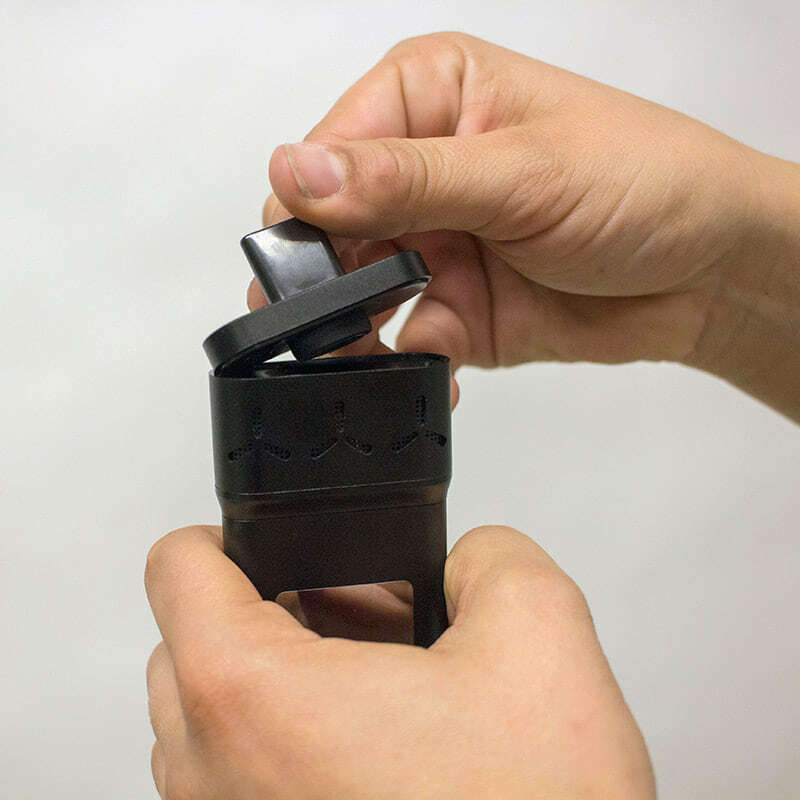 * If you want to use the AirVape X with a concentrate, first place the concentrate pad insert into the ceramic chamber, load concentrate, and then follow steps 2-4. We first tested out the AirVape X with a bowl of dry herb, the Sativa strain Clementine. After packing a large bowl, mostly because the AirVape X’s oval ceramic chamber can hold more than most vape chambers, we turned on the device and set the temperature to 400 degrees. 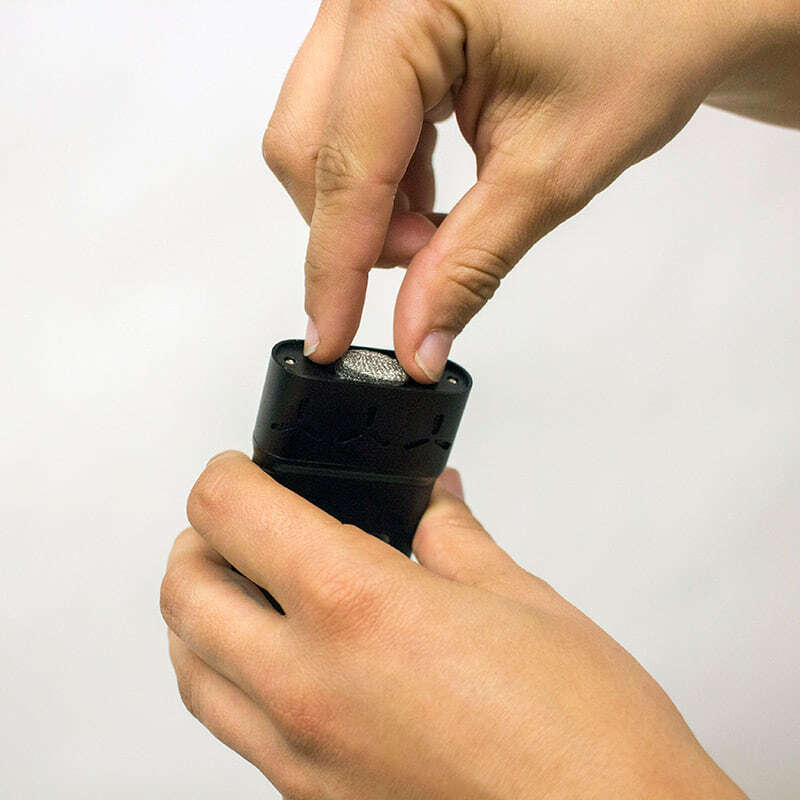 The AirVape X gives you a friendly little vibrate to let you know that it’s finished heating up. The first few drags exuded tasty, but lighter hits. However, 30-40 seconds into the session, starting at the 2:20 or 2:00-minute mark on the automatic shutoff timer listed on the digital screen, the AirVape X was seriously ripping. The hits were full and potent, with an unbelievable amount of citrus flavors accentuated from the Clementine strain we were vaping. Each pull released a substantial cloud and reliable hit until the very end of the 3-minute session. Switching from using the AirVape X with flowers to using it with cannabis wax and concentrates was simple. 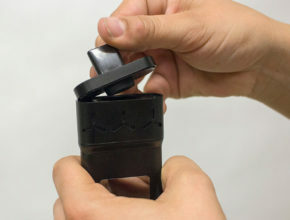 After vaping a dry herb bowl, we dumped out the vaped herb, lightly cleaned the chamber with the included brush tool, and then placed the concentrate pad insert inside the chamber. 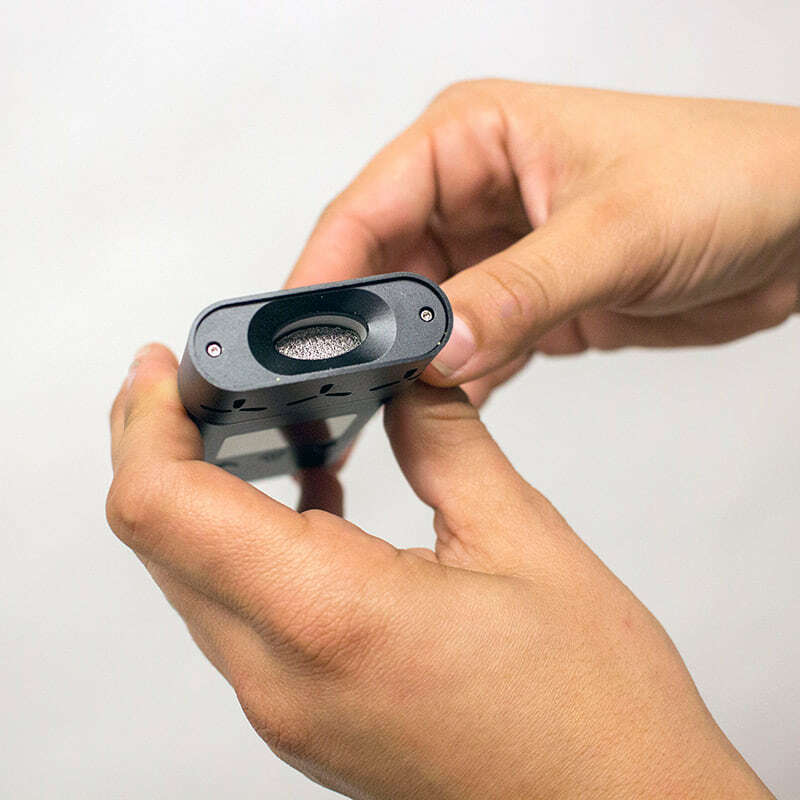 We loaded some of our concentrate directly onto the pad, snapped the magnetic mouthpiece into place and set the temperature to the AirVape X’s highest temperature setting of 428 degrees. 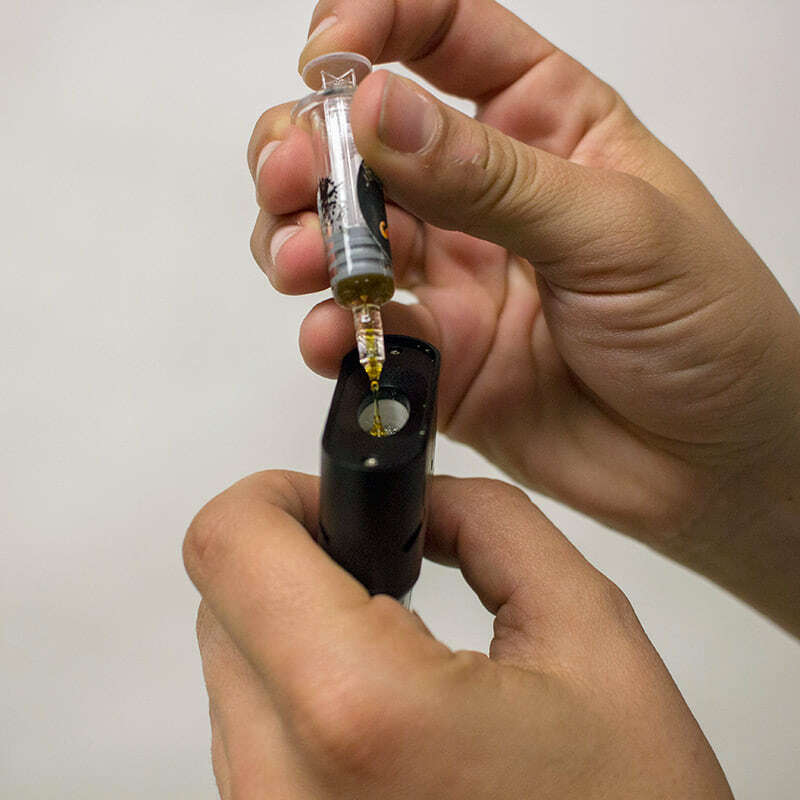 We used some Magic Pipe oil that’s available in pre-filled syringes for easy dispensing. Similarly to when we used dry herb, the first few hits were light, but still gave off great flavor. Within 30 seconds of our session, each pull would produce thick, luscious hits that were surprisingly smooth, and didn’t make the wax too hot when it hit our throats. There was little to no coughing while taking drags from the AirVape X. We found that the battery lasts for about 7 or 8 sessions, which for us, who smoke and vape quite heavily, ended up lasting two days. 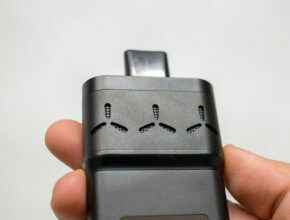 The battery is charged using a micro USB connector, and the device can be used while charging if the battery is not totally depleted. The AirVape X vape surpassed our expectations, not only due to its impeccable design, but also its reliable functionality with both dry herb and concentrates. Switching between dry herb and concentrate vaping is seamless and enjoyable with the AirVape X. It’s definitely impressive how well the device performs with both forms of the cannabis product, and we highly recommend it for users that enjoy both dry herb and concentrates. 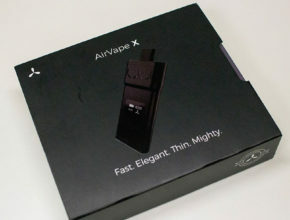 You can purchase the AirVape X online via airvape.com for $179.00. They also offer payment plan options so you can set up four automatic payments of $44.75 (interest-free). 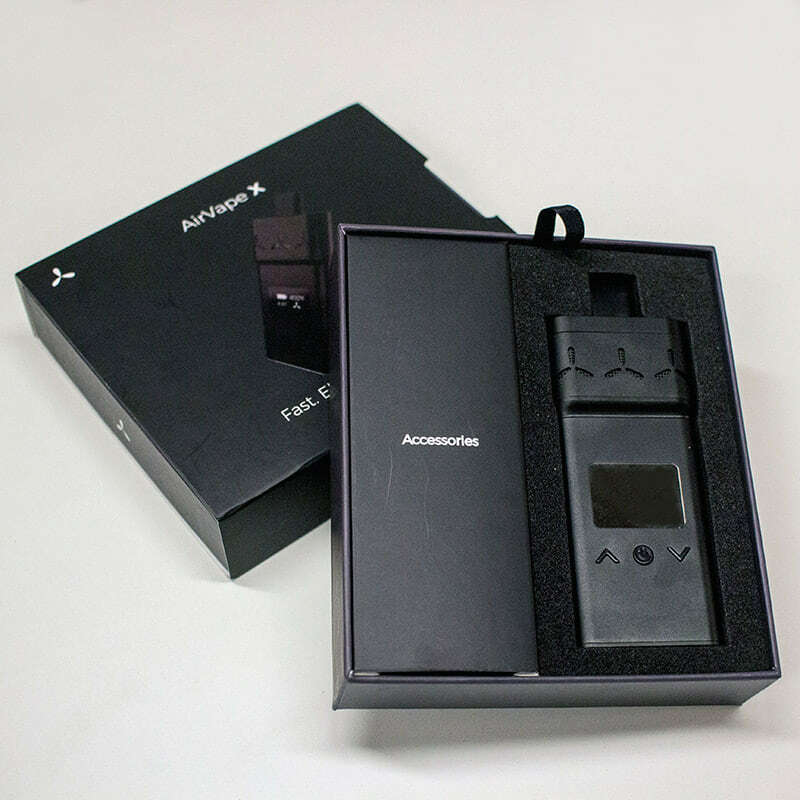 The AirVape X comes with a limited lifetime warranty. 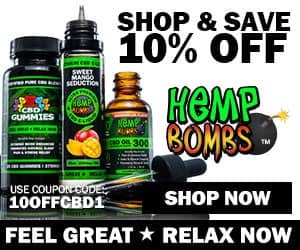 Register your vape at airvape.com. 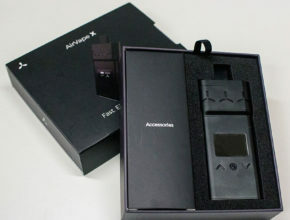 AirVape will soon be releasing the AirVape X kit which includes the X Shell protective case. 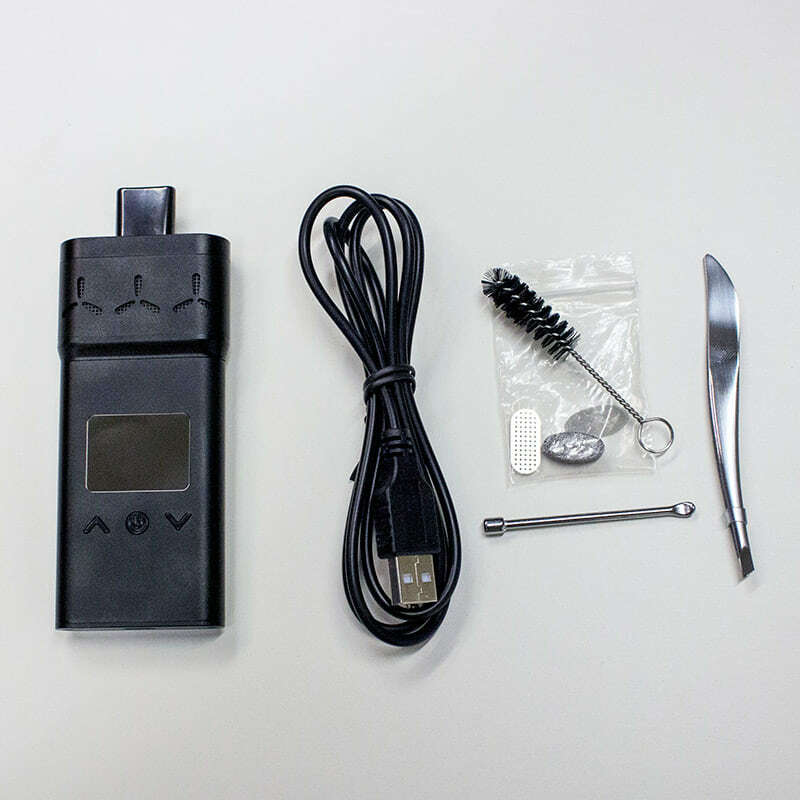 Check out our previous review on the AirVape Xs and the low cost G Pen Pro dry herb vape. 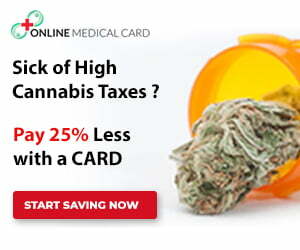 You may also be interested in our other dry herb and combo vaporizer reviews.